TORONTO, ON – On Thursday May 4, 2018, members of the Direct Sellers Association of Canada (DSA) gathered in Ottawa for their annual Lobby Day, with a focus on NAFTA negotiations and ensuring a fair outcome for Canadian entrepreneurs. During the course of the latest round of NAFTA negotiations, the issue of raising the de minimis threshold (DMT) has been brought up as a potential negotiation bargaining chip for Canada. The DSA and its members met with more than 15 elected officials on Thursday to caution that raising the DMT from its current $20 level would be detrimental to the direct selling industry and the Canadian economy. 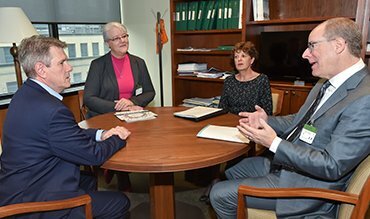 Other issues discussed during the DSA’s meetings included providing a fair regulatory playing-field in support of direct selling’s growth and promoting the important economic impact the direct selling industry has on the Canadian economy, particularly for women and rural Canadians.